As the Nashville weather is getting nicer, we here at Friendly Arctic are getting STOKED on the upcoming season of Musicians Corner (starting May 12th)! We have been honored to be their T-shirt supplier for many years now. Check out our work at the event merch table, or at the Parthenon Gift Shop! 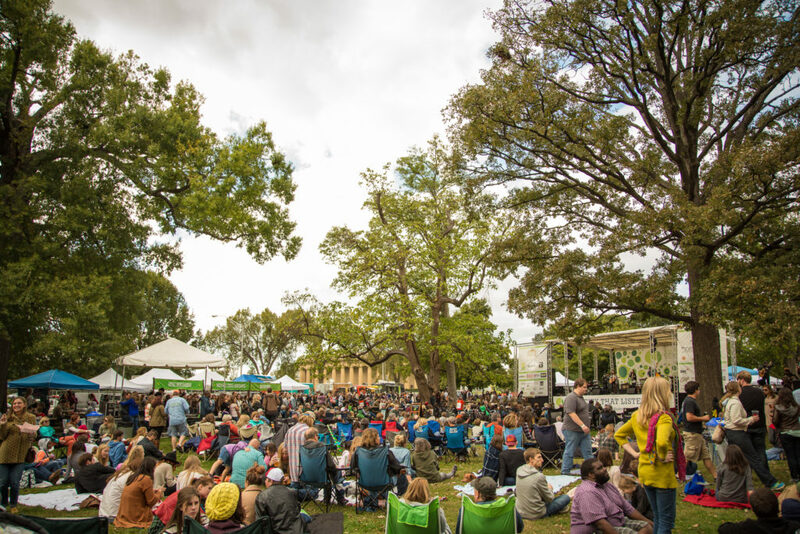 Musicians Corner is a non-profit program from the Conservancy for the Parthenon and Centennial Park. 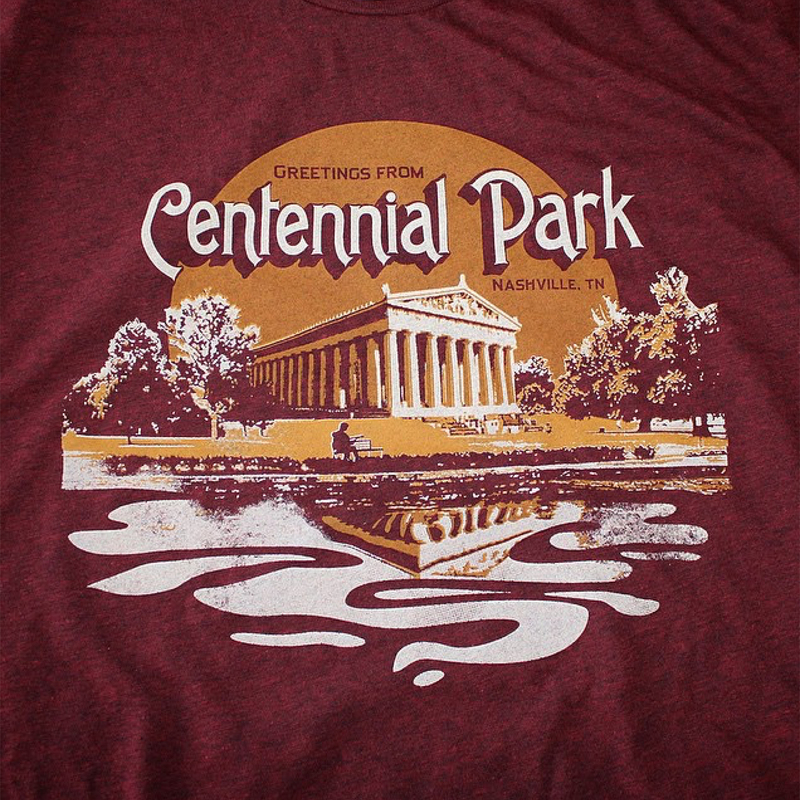 The Conservancy has been helping to fund Nashville’s Centennial Park and the new revitalization in a variety of fundraisers and events, around the park and inside the Parthenon. 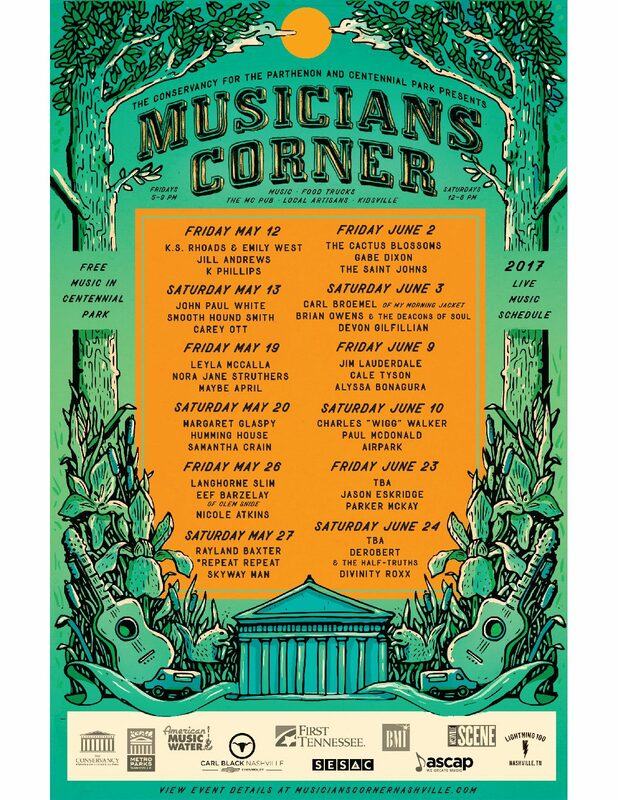 Musicians Corner is a free concert series for the public to attend. It is family and dog friendly, with food trucks, local artisan vendors, and an awesome outdoor pub! That coupled with some unparalleled people-watching and community makes this event a truly great way to enjoy the city! A couple years ago we were tasked with designing a tee for sale at the event merch table. We wanted to play off of the musician theme, so we created an image of a guitarist sitting on a park bench in the shadow of the Parthenon. We also wanted the design to have a vintage feel, like an old postcard. Therefore, we went with a single pass printing technique and a muted “vintage gold” ink color on a lightweight triblend tee. This keeps the print feeling super soft, soaking into the shirt fabric a little bit, and after a couple of washes the print doesn’t even feel like it’s there! Perfect for a nice, hot summer day in the Park! We are so excited to attend this year’s Musicians Corner! This year’s schedule includes many Friendly Arctic merch alums, too! These include the likes of Jill Andrews, Humming House, Smooth Hound Smith, Devon Gilfillian, and Airpark! Full lineup is below, you don’t want to miss it. Be sure and make it out and enjoy some top-notch music with some local craft beer! Don’t forget to buy a t-shirt!